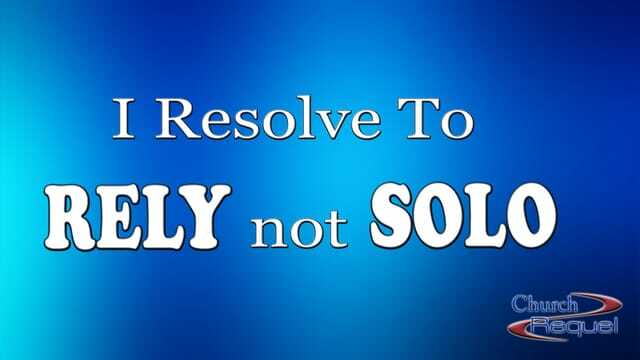 Today we continue our mini-resolution series with the resolution to rely upon God and not to go solo on our own. We will consider many different verses from God's Word and discover that we were never designed to be independent from the God Who created us and loves us. We resolve to live out God's will. Why? To bring heaven to earth. Lord's Prayer. We usually focus on personal, when we should focus on moral. The nature of God's moral will is the expression in behavioral terms of the character of God. "You shall be holy as I am holy." #1 - He ______________________ than me. It's not like God wants to keep everything a secret from you. Many times we don't know because we don't ask. Remember our talk from last week that God's answers are often directional steps of faith. Have we done it? #2 - He _____________________ than me. God's strength is not for God's use alone. God also gives us His strength to supplement our own so we can handle more than what we alone could handle as a (mom, dad, employee, support person, adult child of declining parent). When we are weak is when we know we need God. Often we wait to long to reach out to God. We mistake our current ability to handle things as not really needing to bother God with it. God's Word says that's not really the way it works with God's strength. If we want to avail ourselves of God's strength, we don't wait until we need it. Rather we seek it continually. Seeking God's strength is like a muscle. Use it or lose it. When we haven't been seeking God all along, it's harder to go to Him in an emergency. #3 - He _______________________ than I am. God is not limited in His resources. We always are - no matter how wealthy we may be. We live in an economic world, meaning limited resources. God is the exact opposite. He doesn't know limitation. So when it comes to supplying our needs, God does so "according to his riches in glory." Is there any limitation of God's rich glory? NONE! We live in a world of good days and bad days. Change. Things that we could depend upon at one time, we no longer can. Example, that good job. Or the loved one who is no longer here. The only thing that doesn't change around here is... change! But God's resources available to us are not like that. "Nor variation." "No shadow." No darkening of God's resources "due to change." In fact God provides our needs as gifts - always good. Always perfect. Always just what we need just in time! #4 He _______________________ than I do. Have you ever wanted to give a good gift to someone, but you really didn't know what they would want. What do we ask for? A wish list, please.But God is not like that. We are God's workmanship! You know those tags that say "Made in the USA?' Or sometimes really special handmade items will have the signature of the maker? I have a ukulele that has his stamp imprinted on the back. "S. Seelye." He takes pride in his workmanship. Same is true with God! This Bible verse is our signature that God's stamp is upon each one of us. One translation even says, "We are God's masterpiece!" God not only knows you, but He knows the work that turns you on! God not only created you, but He created the good work for you to walk in. Notice not "to do" but "to walk in." Living out the life of good works that God has created for you is as easy as walking. You just put one step in front of the next. "Good works." Not just good for others but for you too! Notice how God's Word describes these good works - as plans for your well being (welfare), for good (not for evil), as something to anticipate, to look forward to (a future and a hope.) But what about when your life is not going the way you hoped, when you don't see a good future? #5 - He _____________________ me (even when I don't). God did not just create you and then say, "Good luck with that!" And then you never see Him again. God wants to be there for you even more than you think! What does "casting" bring to mind? For me, fishing. I cast out the line. But that's a really bad analogy because we then reel it right back in. Sadly that's what we do with our anxieties. We cast them to God only to reel them back in to ourselves. The actual Greek word is to "toss upon." Think of the Ring Toss at a Carnival, where you are trying to toss the ring upon a bottle top. There is a counter in front of you and there's no getting that ring back. Once you let go, it's gone. This is what God has in mind. Also God isn't like a Counselor you pay to go to talk to and then you walk away still holding onto all your problems. God wants to help you! So can you go it alone? Sure! God won't force Himself upon you. But why would you want to? Who doesn't want God on your side? To strengthen, to help, to literally "hold up" in tough times?! When we don't seek out God's help and think we can get along on our own - we are not just stubborn. We're not just arrogant. We are also ignorant! #6 - He designed me for ____________________ . When you become a Christ-follower you also become a receptacle for God's Holy Spirit. God created you with a place for His Spirit to live and partner with you and your life. Just like a branch cut off from a tree will not live, you apart from God's help will not thrive. What does a branch look like that's been cut off? All brown and dried up. What about you today? Is that a picture of your soul? Ask God for His help! He is just waiting to fill you up with all that you need to thrive in your life!